I can never pass up a good Apollo documentary. I should probably credit the 1995 Apollo 13 blockbuster for sparking my interest in the Apollo program, so it’s perhaps no surprise that Ron Howard’s 2007 documentary In the Shadow of the Moon was so appealing. The standard route through an Apollo documentary begins with Kennedy’s “We choose to go to the moon and do the other things” speech, mourns the Apollo 1 tragedy, shows pictures of Earth from Apollo 8 and video of the moon from Apollo 11, and if there’s time applauds mission control in the context of Apollo 13. The hour and 39 minute documentary In the Shadow of the Moon takes the same basic trip, but refreshingly from the personal perspectives of the astronauts themselves. With extensive interviews with the astronauts (and none with mission controllers that I noticed), we get an entirely first-hand telling of the events as they happened up on the moon and en route. When you land on the Moon, and you stop, and you get out, nobody’s out there. This little LM, and then two of you, you’re it. On this whole big place. What sold me entirely, though, was the Apollo 11 landing sequence. Everyone’s heard the radio exchanges and watched video of barren lunar surface streaming past a Lunar Module window — and I’ve listened to those tapes a dozen times now. People worldwide can recognize the exchange first spoken when the lander touched down: “The Eagle has Landed.” “Roger, Tranquility. We copy you on the ground. You got a bunch of guys about to turn blue; we’re breathing again.” Charlie Duke, acting as CAPCOM, can barely get the words out. In the Shadow of the Moon plays the same tape, but shows the video feed from inside mission control — video I never knew existed before. There, when Charlie Duke replies, “Roger Tranquility,” are the very real bunch of guys about to turn blue, some clearly about to burst with excitement. It took a lot to surprise me with what looked like a routine Apollo history flick, but this absolutely did the trick. Acting on some old recommendations, I watched King Corn today. I thought it would be good “background documentary” — something to have on in the background while I played on my laptop. From the moment it started, I barely touched the laptop. The film follows two friends who move to Iowa to farm an acre of corn and see what happens to it. A huge amount, it turns out, ends up feeding the cattle that become our hamburgers, and another huge amount becomes the high-fructose corn syrup that sweetens virtually everything we eat. The moral: you’re eating corn with every meal whether you think you are or not. We subsidize the Happy Meals, but we don’t subsidize the healthy ones. I’d already replaced all my frozen corn with frozen peas after friends recommended this movie. Now I’ll also be hunting down the excess high-fructose corn syrup in my kitchen. I listened attentively every time someone recommended that I watch Firefly, and then practiced the fine art of procrastination in never watching it. The series ended over six years ago, but I’ve finally caught up now. If you take sexual advantage of her, you’re going to burn in a very special level of hell — a level they reserve for child molesters and people who talk at the theater. My days of not taking you seriously are sure coming to a middle. I found Serenity (the followup movie) somewhat underwhelming. It seemed to seek a plot great enough to commit to the big screen, when the episodic plots of the television show were a far better fit for the characters. But even if Serenity were entirely lifeless (which it’s not), Firefly would still have been fantastic enough to compensate. I will now immediately buy my own set of DVDs, and if only someone made a Firefly tee shirt I’d buy that too. You must watch Juno. This independent movie stars Ellen Page and features Jennifer Garner, Jason Bateman, and Allison Janney (for starters), and tells the story of a girl who gets pregnant. I expected to see either “an emotional roller coaster” or “a heartwarming tale of a young girl’s battle to overcome family adversity and raise a child alone.” This movie is neither. It’s a charming story, in fact. A girl in a loving family finds herself pregnant, and works through the situation. She’s funny, her family at no point threatens to kick her out if she doesn’t get her act together, and the film never takes itself too seriously. It’s the best of what independent cinema can do. Bleeker: So what do you think we should do? Juno: I thought I might, you know, nip it in the bud before it gets worse. Because I heard in health class that pregnancy often results in an infant. Bleeker: Yeah, typically. That’s what happens when our moms and teachers get pregnant. 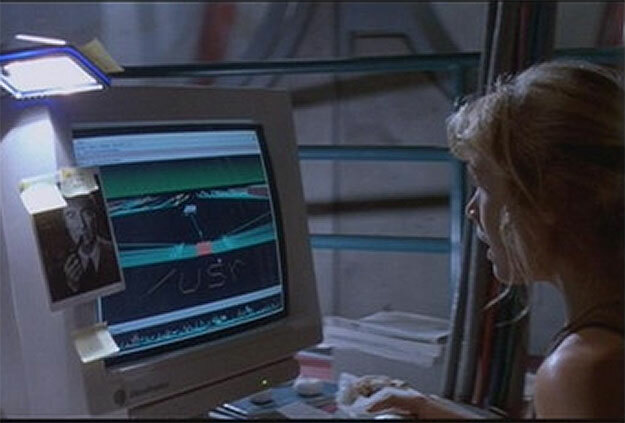 I love analyzing how computers in movies work. In S1m0ne, director Viktor Taransky replaces a high-maintenance actress who’s walked off the set of his movie with a computer-generated actress. The public thinks she’s a real person and demands to see more of her. Taransky eventually responds by scheduling a huge stadium concert, where Simone appears in hologram form amid a stage full of smoke. It’s lucky the computer comes with that button on it. Otherwise he never would have pulled it off. It would be like Jurassic Park. I’d be suspended in Jell-o forever. Don’t judge too quickly. With all the plot holes in that movie, we might well have overlooked eternal Jell-o suspension in there somewhere. 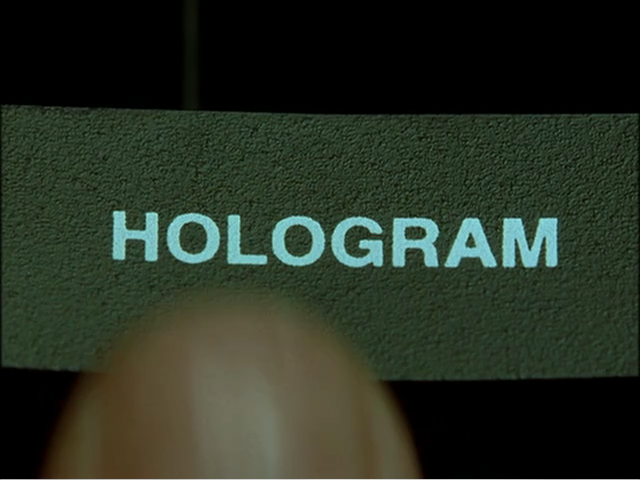 I love analyzing how computers work in movies. Someone on the production staff must know something about computers to get the fake systems to appear operational, but at some point during the process the desire for flashy technology overrides that real-world knowledge. I started watching National Treasure: Book of Secrets this afternoon. If the first film is any indication, this promises a wealth of unlikely technological behavior. In the first split second of screen exposure you should recognize the fonts and proportions of Wikipedia. An image is floated right, and the familiar Monobook navigation menu is on the right. 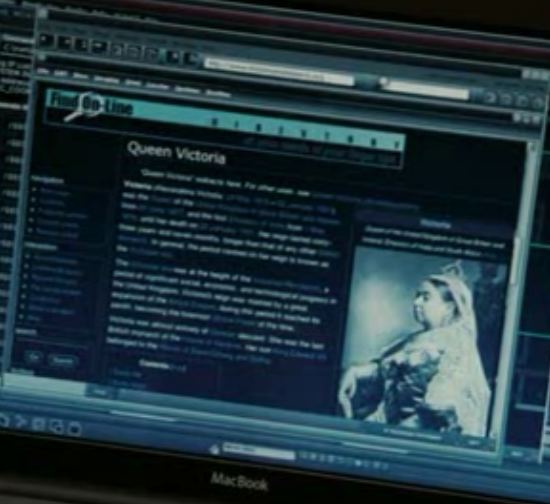 In the remaining second or two you see the image, you might also notice the unusually high concentration of links in the text, and maybe even the way the first line is indented (à la “Queen Victoria redirects here. For other uses…”). Finally, let’s take a moment to reflect that although Riley is using a MacBook, he appears to be running applications that borrow heavily from both Windows and Linux.